Hello ... Hello ... my old friends ... It's great to see you once again! When the above DigiPack CD entitled "Live London 1976" popped up on amazon.co.uk recently, Yours Truly KJS just couldn't resist buying a copy for the sake of curiosity. Remember these ELOBF articles last year? 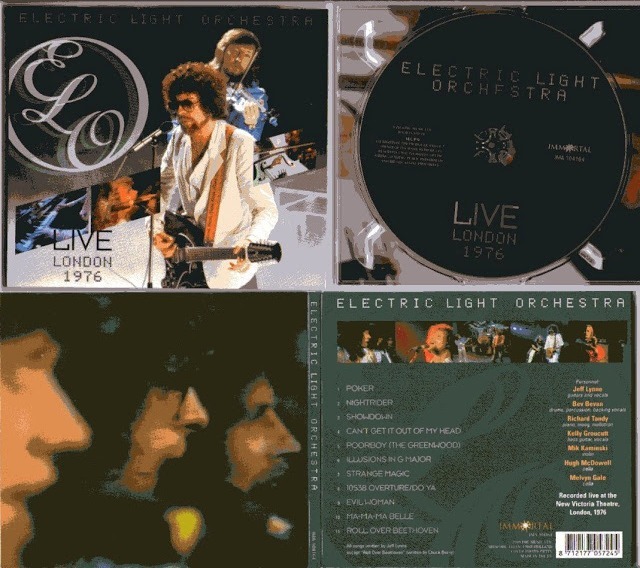 "This 1976 London concert finds Electric Light Orchestra in the midst of its breakout moment, when songs like "Evil Woman" and "Strange Magic" were becoming huge U.S. hits for one of the more accessible of the British progressive rock bands. The band began in 1971, when Birmingham, UK guitarist and singer Jeff Lynne, formerly of the Idle Race, joined up with guitarist and singer Roy Wood, of the Move, and drummer Bev Bevan. Wood and Lynne were heavily influenced by recent Beatles albums, which extended rock into symphonic and other classical sounds. At first ELO might have appeared to be an extension of the Move: the earlier band continued to release albums that helped pay for ELO's experimentations in recording. For their later albums the Beatles had been able to avail themselves of sophisticated resources and technology - and they no longer performed live. Developing late-Beatles musical elaborations for a gigging stage act by a new recording outfit was an ambitious project. ELO soon added Bill Hunt on keyboards and horns and Steve Woolam on violin. For live shows, they brought in other classically trained and rock sidemen. The first album featured "10538 Overture", which the band performs here; it became a top-ten hit in the U.K. Wood soon left the band with Hunt and Woolam. Lynne stepped into a leadership role, and brought in new players. He also wrote the songs. The band now had a huge sound, mixing synthesizers, brass, strings, and hard driving rock in ambitious songs. Lynne began learning how to balance the acoustic and amplified instruments for an integrated sound that worked well in arenas. "ELO II" featured a cover of Chuck Berry's "Roll Over Beethoven", another top-ten U.K. hit, also heard in this concert. Further personnel changes occurred and stabilized as the band began to achieve its mature sound under Lynne's direction. The fourth album, "Eldorado, A Symphony" put the string section live in the studio, not overdubbed, and Louis Clark became a member of the band as a string arranger. By the time this concert was recorded in 1976, ELO had also developed a strong following in the U.S. Rock television was evolving, with shows like "Rock Concert" and "Midnight Special" bringing the big, flashy arena sound of the early 1970's to the TV studio and the small screen. ELO appeared repeatedly on "Midnight Special". "Can't Get It Out Of My Head" reached the U.S. top-ten. "Evil Woman", from the 1975 album "Face The Music", had an edge-of-disco sound that also crossed over to U.S. pop, as did "Strange Magic". In 1976, ELO played an intense, gruelling tour throughout the U.S. The band was now an established international touring and recording phenomenon. This concert thus finds ELO right in the middle of its breakout. The concert is characteristic of the mixture of innovation and accessibility the band was purveying in the mid-1970's. The strings, amplified with pickups, are played with rock drive and intensity. Speed and virtuosity are at a premium, but so is a kind of innocent appeal and Brit cheekiness and fun, and absence of anything approaching punk edge or metal aggression. In the years following this concert, ELO would become even bigger, managing to have prog-rock hits in the disco and punk eras." Yep, the cd quality is awful as you said. Shame they didn't use the same mix as the dvd.